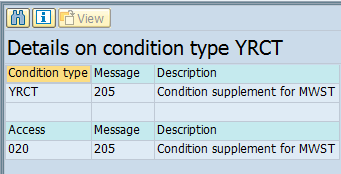 I am using condition supplement functionality in SAP SD pricing. I maintained supplement for MWST condition type. All configuration has been done. However, system behavior is little weird. 1) At SO level, pricing is fine. 2) At invoice level supplement condition type appearing twice in condition screen. 3) If I update pricing in invoice, duplicate condition type is getting disappeared. Then rest is fine. Below solution is suggested by SAP after we raised service request. The same we implemented successfully. Now problem has been resolved. Action Taken – To prevent YRCT(coming from SO) getting copied into xkomv. I hope this blog will be useful for those who are using condition supplement functionality.